The Harmonie universelle is a detailed examination of musical issues. Several pages of one part are devoted to “Proposition VI. Expliquer la vraye raison & la cause du tremblement des chorders qui sont à l’Unisson”. Mersenne was explicitly opposed to any talk of sympathy (or of occult qualities) here, for “saying that strings in unison move because of sympathy is the same as saying that one does not know the cause”. He offered, instead, a mechanical explanation of the phenomenon. Suppose that the two strings AB and CD are in unison. Then suppose that AB is pulled back to H and then released. The string CD will also move, which is the phenomenon to be explained. The explanation, Mersenne says, involves the vibrations of the air caused by the motion of the string AB. The basic point is that as the string AB moves forward when released, it pushes the air in front of it, and the movement of the air causes the movement of CD. As the centre of string AB moves from point H to point F to point I, it pushes air before it, which moves the centre of CD from G to E. Both strings rebound, and then the centre of the string AB again moves towards I, pushing the air again. And as long as AB continues to move, it will continue to impart this motion to CD: if you temporarily impede the motion of CD, then release it, it will start moving again as long as you have not also stopped AB. More objects to this sort of explanation, on the grounds that we invoke the motion of the air like this, we should find that it moves all sorts of other things that it does not. Suppose we suspended a light object on a silk thread between AB and CD. If a vibration of the air caused by AB is what makes CD move then, More argued, it should also make this object move. But it does not: it only makes the unison string move (More 1659, 451-2). Mersenne was aware of this sort of objection, and explained why we only get this sympathetic resonance in certain cases (of which strings in unison are a prime example). In these cases, the second movement of the string AB towards the string CD is synchronized, one might say, with the movement that CD has already gained from the first movement of AB. In other cases, the second movement of AB will still push the air and thus push CD, but will do so in a way that interferes with the movement previously given to CD. More had, however, a second objection to Mersenne’s sort of explanation. It is all very well, he thinks, to tell this sort of story about strings in a special arrangement, where they lie horizontally and parallel, but it does not generalize to other cases. Mersenne’s explanatory model might seem almost two-dimensional, and to depend on the two strings lying in the same plane, indeed parallel to one another in that plane. 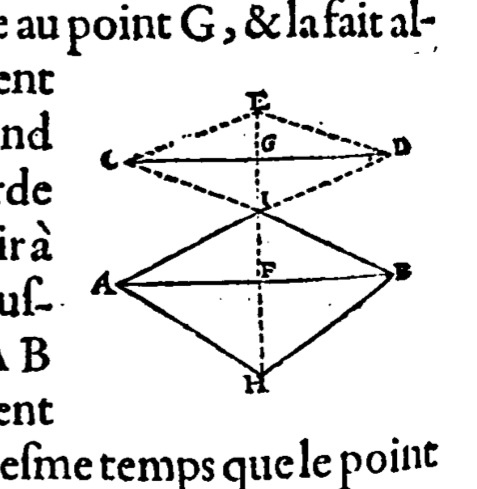 The movement of AB seems also to be in that plane, as the centre point of AB is pulled horizontally (so to speak) away from CD and then moves back towards it. The pushed air is again moving in that plane. The model is not exactly two-dimensional, as the string, and the part of the air pushed by it, will have some height. But one might think — and More thought — that we are really considering a rather special case, with the strings in a particular alignment. It is there that More found room to object. If two strings did, for instance, lie horizontally and parallel, and the first were to vibrate from side to side, one could understand how the consequent movement of the air might cause the second string to move from side to side. This model breaks down, More thought, if the strings are differently arranged. If the first string vibrates up and down rather than side to side, or if the second is raised up above the horizontally vibrating first (and thus, intuitively, above the plane of horizontal vibration of the air) then we would expect the sympathetic vibration to cease, but in fact it continues in much the same way. All which things do clearly shew, that pure corporeal causes cannot produce this effect: and that therefore we must suppose, that both the strings are united with some one incorporeal Being, which has a different Unity and Activity from Matter, but yet Sympathy therewith; which affecting this immaterial Being, makes it affect the Matter in the same manner in another place, where it does symbolize with that other in some predisposition or qualification, as these two strings doe in being tuned Unisons to one another (More 1659, 452-3). In giving this explanation, More invokes sympathy. But it is not sympathy between the two strings, the sort of explanation in terms of sympathy that Mersenne criticized as not really being an explanation at all. Rather, ‘sympathy’ here is a term for the relationship between the corporeal world (the strings in particular) and the incorporeal substance involved (the spirit of nature). There is a continuity of terminology with views that simply invoke sympathy between the strings as an explanation, but the explanation is not the same. More’s appeals to more things in the world: the two strings, and the spirit of nature, and the sympathy between the spirit and the strings, rather than just the strings and the sympathy between them. Bacon, Francis. 1627. Sylva Sylvarum. London. Gouk, Penelope. 1999. Music, Science, and Natural Magic in Seventeenth-Century England. New Haven: Yale University Press. Mersenne, Marin. 1636. Harmonie universelle. Paris. More, Henry. 1659. The Immortality of the Soul. London.